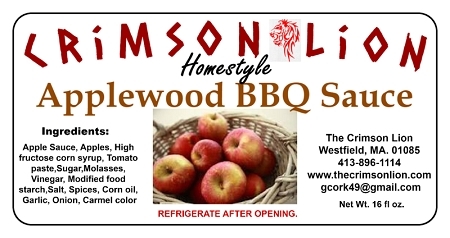 l Applewood Barbecue Sauce-19 oz. 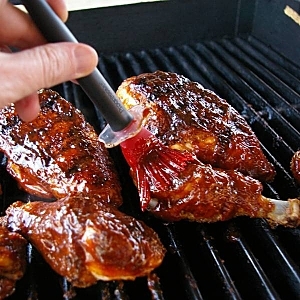 Home > Shopping Store > BBQ Sauces Shopping Cart > Applewood Barbecue Sauce-19 oz. Applewood bbq is fantastic with just about anything. We like to spread it on seafood, steak, pork, chicken, Buffalo wings etc. The tomato, garlic, sugar combination gives your food an outstanding sweet flavor. Contains applesauce, (apples, high fructose corn syrup), tomato paste, sugar, molasses, vinegar, modified corn starch, salt, spices, corn oil, garlic, onion, caramel color. This is our top selling barbecue sauce.